Polis Diraja Malaysia just announced on their Facebook Page that starting 1 Dec 2010 the new rate for Traffic Compoun/ Summons (Kadar Baru Kompaun Saman Trafik) will be applied. - Traffic ticket that was paid in 15 days will be given 50% discount. - No discount will be given for people who pay the traffic ticket later than 30 days. He/she will be blacklisted for not paying it. > Traffic COPS Counter at selected shopping complex. How to pay the saman/summons? With my experience of waiting for the queue, it is advisable that you pay your Traffic Tickets Online. You can pay online through www.myeg.com.my using your Debit Card. 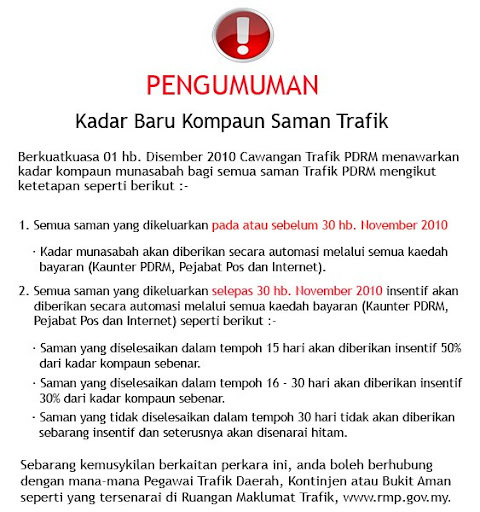 Remember to clear your saman before PDRM Blacklist you starting 28 Feb 2011. If you have any question/enquiries, do contact them @ http://www.rmp.gov.my. Nora Danish received her saman and took picture with the policeman. So when people asking you, " Macam mana nak settle?". You can answer, "I will settle online la". I know I got A FEW summons and I don't dare to check how much is the total coz scared heart attack terus! Hahaha..